Properties in Kina Peninsula average 4.6 out of 5 stars. Property 4: Delightful cottage a perfect couples retreat. Property 10: Quiet , Stylish 2 bedroom Apartment , situated in the heart of town. 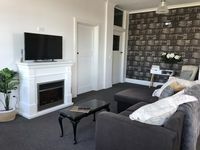 Property 27: Central Motueka Luxury Accommodation. Property 30: Tranquil rural location with mountain views. Free WiFi. Quiet and Cozy Cottage just a stone's throw from Kina Beach! Property 34: Quiet and Cozy Cottage just a stone's throw from Kina Beach! Property 36: Rural paradise studio with solar heated pool. Property 48: Renovated Barn + great views, new for Easter 18. 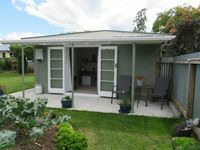 Peaceful Getaway close to Abel Tasman Park, Kaiteriteri and Motueka. Property 50: Peaceful Getaway close to Abel Tasman Park, Kaiteriteri and Motueka.